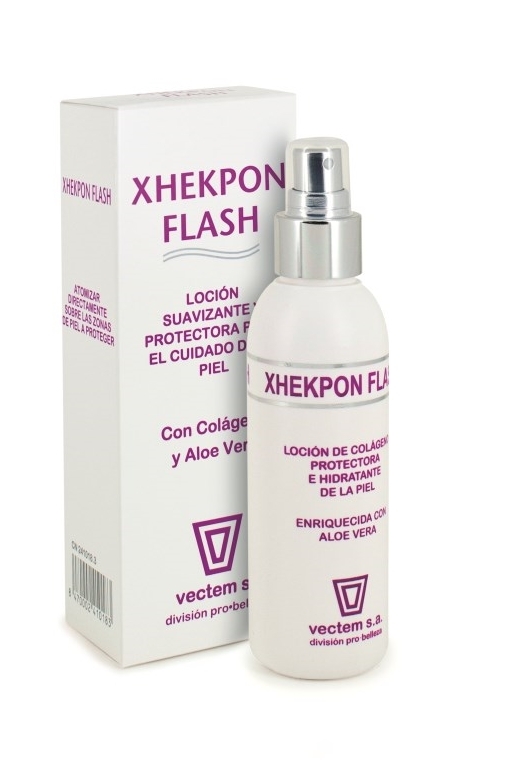 XHEKPON FLASH , vectem s.a. Lotion formulated with collagen and Aloe Vera, for the body, face and scalp. Softens and cares for the skin. Flash tensing effect. Helps relieve and reduce sun-induced skin redness. Prevents irritation caused by depilation or shaving. Promotes even tanning after sunbathing. Provides a light hold for hair. Forms a thin, protective film for activities outdoors or in polluted environments. Easy to apply. Spray directly onto the areas to be treated. Do not rub in.